Opening a thread to talk about the next generation Soul EV. We don't really know anything about this car yet, other than it has the codename SK EV. What it says suggests the entire Soul range will be updated onto a bigger frame. Kia Motors will change the concept of its third generation " Soul (SK 3), " which will be released later this year, from a cross-over utility vehicle (CUV) to a sports utility vehicle (SUV). In addition to models of internal combustion engines, such as gasoline and diesel, the new Soul will also be introduced as electric cars that significantly increase its range. The new Soul EV is expected to share next-generation battery system modules with the Kona, EV and N iro EV, which are about to be released this year, to secure a range of more than 300km. There is nothing about the new Kia Soul EV riding on the Kona Platform. There isn't anything else in the Korean press that explains what is coming. We will know more by the middle of the year. Edit: I removed a sentence because it was wrong. The Kona does come in gasoline and EV versions. Last edited by JejuSoul on Sun Dec 16, 2018 8:50 pm, edited 5 times in total. Re: Next Generation Soul will be Bigger! Doesn't look much bigger to me. JejuSoul wrote: Opening a thread to talk about the next generation Soul EV. In addition to models of internal combustion engines, such as gasoline and diesel, the new Soul will also be introduced as electric cars that significantly increase its range. The new Soul EV is expected to share next-generation battery system modules with the Kona, EV and Niro EV, which are about to be released this year, to secure a range of more than 300km. It was the first day of the Jeju EV Expo today. Kia debuted the new N iro EV. The Soul EV on display was exactly the same as last year. I looked at the VIN and it is brand new. Hence for now we must assume that the 2019 Soul EV will be identical to the 2018. I suspect the new version will be MY2020. Last edited by JejuSoul on Fri Jun 15, 2018 7:32 am, edited 1 time in total. It was the first day of the Jeju EV Expo today. Kia debuted the new Niro EV. Next Generation Soul EV will be Bigger! And for Europe only. First the obvious. It will not be based on the Kona platform. Instead it will be based on the N iro EV. There will be 64kWh and 39.2kWh versions. It says the battery will be just like the N iro EV. And the surprise. The new Soul EV will be released only in Europe. Not even to South Korea. wow! No news on whether they will get the MY2019. 28 June 2018 wrote: ...Should you be looking to get a new Kia Soul EV in United States, don't wait long as inventory is quickly dropping. Last edited by JejuSoul on Mon Jul 02, 2018 9:43 am, edited 1 time in total. Thanks for keeping us updated! Much appreciated. My lease is up middle of next year...so hoping that there is a new SOUL to trade to...or at least another EV option. I hope that "Europe only" business is a misinterpretation or something. I would like nothing better than to get a 2020 MY Kia Soul EV with a significant range boost in September of 2019 when the lease is up on our current 2016 one. Adding some more range is about the only thing I'd really want to change. Otherwise it's perfect for us as it is. 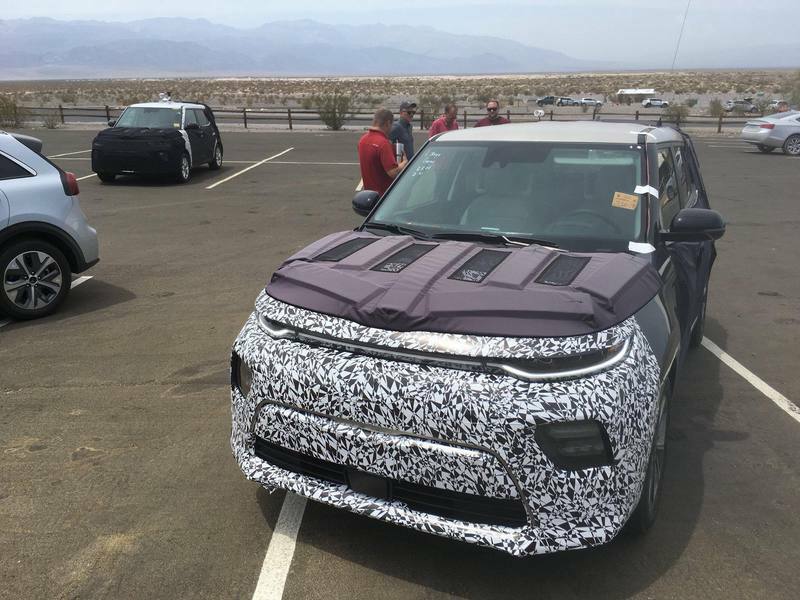 A twitter post by Jonny Smith, a presenter from Fully Charged, shows a new Soul EV in camo testing in Death Valley, USA. I went to the main Kia dealer on the island today to have a look at the N iro EV. The dealer told me the Soul EV has been discontinued, and they no longer sell it.! He said there will be no new Soul EV. I am assuming that means no new Soul EV in South Korea. In this Youtube video Steve Kosowski of Kia Motors America states the new Soul EV will be out later this year. He was the main spokesperson for Kia Motors America 4 years ago when the Soul EV launched, so I think he knows what he is saying.